We cannot tell a lie – The Truth is out and it’s ‘The Whole Truth’. RauDZ Creative Concepts is launching their own craft gin, ‘the Whole Truth’ in collaboration with award-winning distillery, Okanagan Spirits. ‘The Whole Truth’ gin was created to pair with the classic gin and tonic cocktail ‘The Truth’, a drink featured on the opening day cocktail list of RauDZ Regional Table back in Spring 2009. 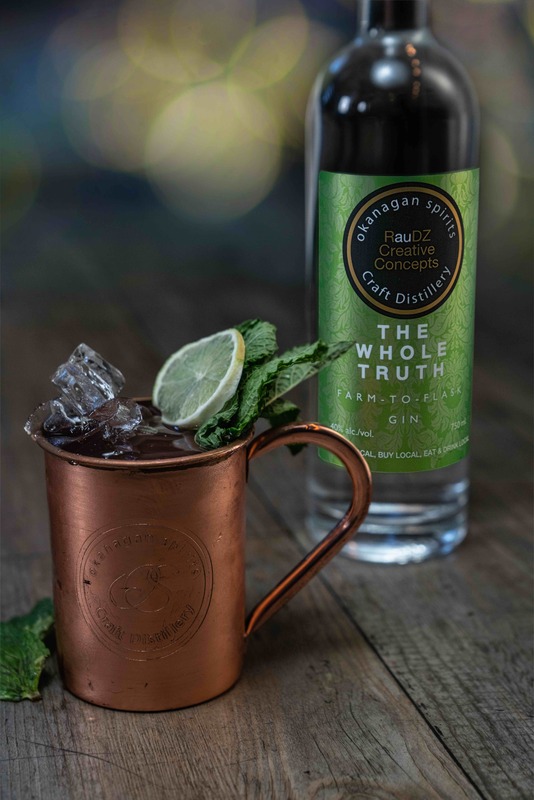 It’s been a hit for the past 10 years and now with the creation of The Whole Truth gin, it has found it’s perfect pairing. In keeping with the RauDZ ‘eat local’ philosophy, you are also ‘drinking local’ with the botanicals found in this custom gin. RauDZ Creative Concepts ‘The Whole Truth’ Gin is cucumber-forward with florals in the background and contains mock orange, a native BC shrub, that was hand foraged by Okanagan Spirits’ Tyler Dyck from Poplar Point, at the foot of Knox Mountain, less than three km from the door of the restaurant. Mint, cucumber, lemon verbena and orris root- the root stock of an iris, each add refreshing, cooling notes that are perfect for gin and tonics. This farm-to-flask gin is available exclusively at RauDZ Regional Table, micro bar & bites, Sunny’s Modern Diner, and Terrafina at Hester Creek by RauDZ. Although originally conceived for ‘The Whole Truth’ cocktail, Wes Hunter, Beverage Operations has put his creative bar skills to the test, developing a custom cocktail for each of the RauDZ Creative Concepts restaurants highlighting this new gin. Terrafina at Hester Creek by RauDZ will feature the gin in a white Negroni with white vermouth, Sunny’s Modern Diner pairs it with citrus and prosecco for a breakfast bubbly and micro bar & bites serves it in their twist on a Moscow Mule. Called ‘Can you Handle the Truth?’ this cocktail is served in a copper mug and covered in fresh mint. ‘The Whole Truth’ gin by RauDZ Creative Concepts launches on the micro cocktail menu on April 11.